A small cart train - method of travelling over the prairies. Source: Archives of Manitoba, Transportation - Red River Cart - 18. To be a guide, riding at the head of a cart-train on a fine horse, was quite an honour in the early days of trading and hunting on the prairies. In 1859 James McKay was one of the most daring and picturesque guides. Later he was to become a Member of Parliament in Manitoba, and when Lord and Lady Dufferin visited Winnipeg in 1877, he acted as their guide. Lady Dufferin was impressed with her Member of Parliament guide. "James McKay has been a mighty hunter in his day, "she said in a letter, "but as he now weighs 320 pounds, he leads a quieter lie. He has a pleasant face and is very cheery but so enormous. It is curious to see him filling up his buggy and driving on before us through bogs, and making signs to our driver. He has lost a thumb and besides this he has had several very narrow escapes of his life. One day he and an English gentleman killed seven grizzly Sitars; and he once killed a mother and two cubs with a lasso. He had no gun with him, and the great bear came towards him on her hind paws; he threw the lasso over her head, and turning his horse quickly away, pulled her over on her back, and strangled her; then he killed the cubs too. He said he thought nothing of it, as he had also killed a black bear with a lasso when he was fourteen years old. Jemmie, his boy of eleven, is always practising picking thigs off the ground when he is on horseback, with a view to future excellence with the lasso." It was the same James McKay that Martin Marble, a writer for Harper's Magazine, met eighteen years earlier, when he was guiding a Red River cart-train to St. Paul from Fort Garry. "Just as we were camping for the night, " Marble recounts, "a train of Red River carts appeared upon the horizon. At first we could hardly imagine what they were - for a moment widening out into battalions, and then shrinking to the width of a single company, so that it seemed we were gazing at a grand army As they came nearer, the illusion was dispelled, and the train looked like a huge land caravan. Then the train approached, each cart wheel having its own individual creak or shriek. The drivers were all half-breeds dressed in a variety of costume, but nearly all showing some flash of gaudy color in belt or sash, or moccasins. Politely touching their caps, they said, Bonjour, to such of us as stood near enough to return the salutation." So young McKay, was captain and guide of the cart-trains carrying furs to trade for goods at St. Paul ... 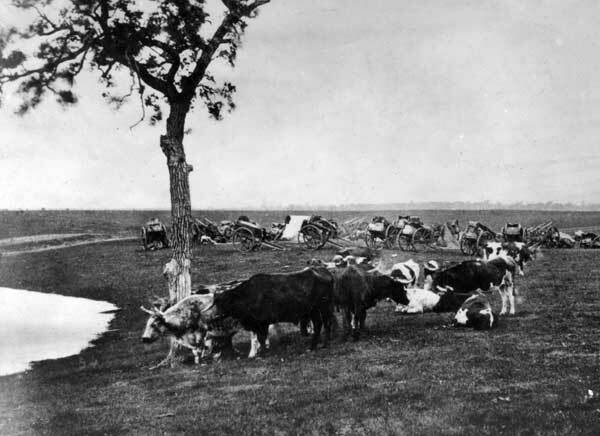 But the Red River carts played a very important part in the spring and fall buffalo hunts. From east, west, north, and south these carts squeaked their way to the hunting grounds. When Martin Marble was at Fort Ellice, he met them going to the hunt. "Pembina buggy, is the honorary title which they sometimes are called, " he said, "and for from five to ten dollars apiece, you may buy them. Twelve hundred pounds can be piled into them on good roads; and even when there is a slough at every half mile and a corduroy road the rest of the way, they carry seven hundred pounds without often breaking With as many carts as he can afford, and at least one buffalo horse, a gun, powder and shot, the hunter is prepared to go to the plains. "Women, boys and old men of the brigade drive two or three carts at a time, and pass the time belaboring the forward ox and yelling to the hinder ones, if they lag." The homeward journey, with the carts piled high with meat, pemmican, and hides, was a joyous one in those early days. It was only when the wagon and buggy became available that the Red River cart gave way to man's demand for comfort and speed. But today one can still see the imprint of the old, Red River cart wheels in trails near Fort Ellice and near Shoal Lake. The cart is gone, but it has left its imprint on the plains, and it still lives in the memories of our old pioneers. In Saskatchewan it has come into its own again - as a marker for historic sites.